Turn these into garlic rolls by adding minced garlic or garlic salt to the melted butter that is brushed onto the dough before cutting. 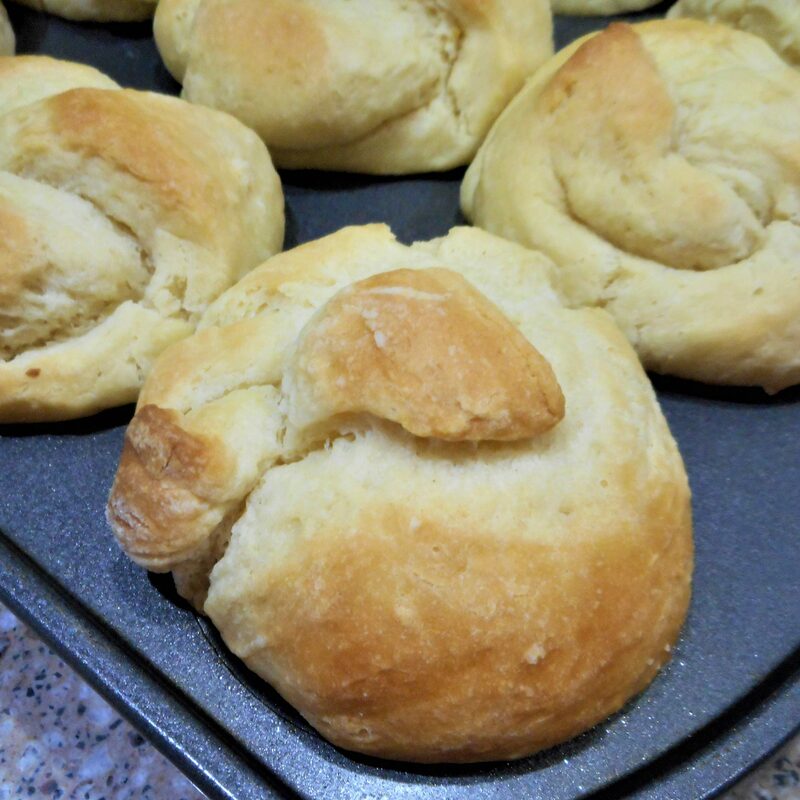 This recipe was adapted from Cowboy Kent Rollins sour dough biscuit recipe. 1. Pre-heat the oven to 350°. Mist a muffin tin with cooking spray. 2. In a large bowl, pour in the starter. Sprinkle on the yeast and add the sugar. Let stand a few minutes for the yeast to dissolve. 3. In another bowl, combine 3 cups of the flour, baking powder, and salt, mixing well. 4. Stir the oil into the starter mixture, then add the flour. The dough should be fairly firm, but you may need to add up to another half cup of flour. 5. Turn the dough out onto a floured surface and fold it onto itself it a time or two, but don’t over-do it. The more you work the dough at this point the drier and tougher your rolls will be. 6. Divide the dough in half. Working with one half at a time, roll the dough into a circle about 1/4 to 1/2 inch thick. Brush with half the melted butter, then cut pizza style into 6 slices. 7. Starting at the thick end, roll each slice into a crescent, then curve each crescent into a cup in the prepared muffin tin. 8. Cover the biscuits with a thin kitchen towel and let rise until doubled. 9. Bake in the pre-heated oven for 35 minutes or until golden brown.